Today’s post is written by Anita Brady. Anita is the President of 123Print.com, a leading provider of a high variety of quality items like business cards, fancy letterhead, and other materials for small businesses and solo practitioners. In the media world, print is a slowly dying breed. From newspapers to books, there’s now a digital alternative for everything. Personally, I love being able to search ‘by word’ on my e-reader and take notes on articles that are automatically sent to my email. Pound for pound, however, the digital realm has yet to overtake print when it comes to business cards. Of course, there are plenty of advantages to being able to ‘bump’ our phones together to trade contacts or send all of our relevant contact data in an email, but something is lost in the transaction. Are you guilty of being caught empty-handed when someone requested your card? Have you recently asked for someone else’s card, only to be told they were out? Although typing in someone’s phone number and email is common enough, the chances of actually initiating follow-up contact without a printed card reminder are greatly reduced. When you put someone’s card into your purse, wallet, or pocket, you will at some point have to remove it. That recollection (and the avoidance of having to ask yourself, “What was her name?”) has inherent value. In a world where we may be in contact with dozens of varied people throughout a day, a ‘paper trail’ helps you to remain memorable and can help you network more effectively. The style of your card’s design immediately reinforces the impression you make upon personally meeting someone. If you’re an artistic, creative type, a non-traditional card in shape, texture, or content can help emphasize the passion you put into your work. Likewise, business people will want to convey strength and simple elegance. Take the time to design a card that speaks to your personality, and show the design to a variety of trusted friends and coworkers before finalizing its look. With all of the money spent on Facebook ads, billboards, and video marketing, it’s pointless to pass up an outlet that provides direct bang-for-your-buck effectiveness. When you place a card into someone’s hand, they have effectively given you permission to market to them, and they’ll revisit your brand at a later date when they clean out their pockets or purse. The price of printing business cards pales in comparison to any other type of advertising, and you can’t beat the 100 percent ‘click through’ rate of physically handing a marketing tool to someone. Depending on your line of work and the purpose of your card, it’s possible to use the backside as a coupon or discount, increasing the value of the card to the holder (and the likelihood that they’ll initiate follow-up contact). Similarly, QR codes can easily be printed on a card, bringing paper into the digital age. By scanning the code with a phone, your website or social media campaign can be instantly accessed through the physical card. Scores of QR code generators exist on the web and are simple to utilize. Even if one generation begins to move away from a means of communication, there is still value in catering to those who prefer traditional means. Business cards are still valuable (even when exchanged between techie 20-somethings), but they’re certainly a necessity when interacting with older potential clients and employers. In some situations, not carrying a card and relying solely on digital contact exchanges could be viewed as unprofessional and a sign of unpreparedness. There are fringe benefits to business cards as well. In busy work/social environments, it can be difficult to remember every person’s name as you mingle and converse. Exchanging cards lets you steal a subtle glance for a reminder, allowing for a warm farewell, by name, when it’s time to part ways. Finally, the same reasons for you to carry a card apply to your decisions about the people you choose to work with. Do you really want to hire an accountant whose card looks sloppy and disorganized? Think of your business card as an extension of your professional attitude. Use it to convey your experience and capabilities, and hand them out with pride. 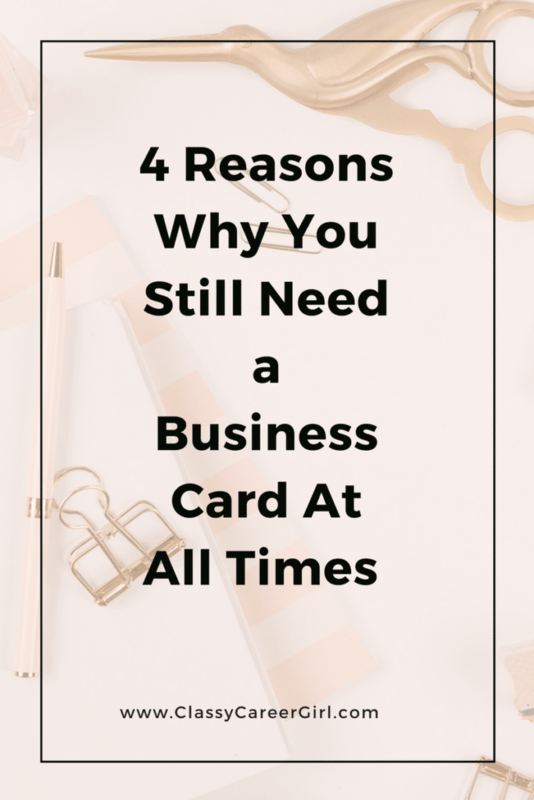 Do you have your business card on you right now?